I’ve been following the news of Diana Nyad, the first person to swim from Cuba to Florida without a shark cage. At age 64, she finally completed a task she had first attempted 35 years ago. When she came out of the water, she bravely advised, “You’re never too old to chase your dreams.” Apparently, there are some in the marathon swimming community who doubt that she completed the distance without “cheating,” ie, getting into a boat to rest at some point, drafting on the current created by the boat in front of her. No matter what the investigations reveal, I’m still amazed. Swimming is an incredibly difficult activity. It works all of the muscles in your body. When you get tired, the hardest thing to do is what you need to do the most: breathe. You’re surrounded by a substance that can overtake you and end your life in a matter of minutes. And yet you depend on that substance to hold you up and perhaps, even propel you forward. But more than that, I saw that the water could transform you. My mom had MS and as a child, I saw her struggle each day to put one foot in front of the other. Eventually, she began using a motorized wheelchair to travel long distances, and that included getting her down to the pool. My mom loved to swim like I did. And as MS began ravaging her body, taking away her mobility, she fought back in the water. Her upper body was still strong, and when she slid into the water, she was powerful, a machine. She would crank out laps like it was her job. Pulling her useless legs through the water, I saw my mom become a force to be reckoned with. The water gave her life. Life is full of barriers. Diana Nyad apparently never let those roadblocks distract her from her goal. She learned from her experience and kept moving forward. 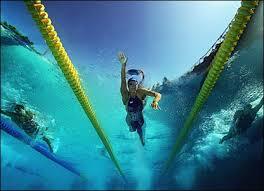 The endurance swimmer in my life never let roadblocks hold her back, either. My mom kept moving, using the water as her ally, never giving up. So on the days when the world is throwing up roadblock after roadblock, I remember my mom, slicing through the water, smooth and powerful. And I know that nothing can keep me down for long. The water (of baptism) gives me life.